We have over 18 years practical experience in designing, implementing and maintaining Computer Networks, using trained and qualified Network Systems Engineers. We provide a total Computer Network Installation and Consultancy service including everything from the Category 5 / 6 cable or Fibre Optic cable installation to IP Schematic Design and Router Configuration using hardware from vendors such as HP, Dell, Cisco, 3COM, APC, Draytek, Juniper and WatchGuard, to name but a few. Our experience include the setup of demilitiarised zones (DMZs), VLAN installation, complex Virtual Private Networks (VPNs) and Voice over Internet Protocol (Voice over IP or VOIP). Vintage Technologies are also well known for installing high-quality / high-availability Wireless Networks (Wireless LANs), typically used in situations such as night clubs, bars and restaurants, where it is essential to maintain availability at all times for the use of hand-held terminals. Local Area Networks, or LANs, are often given less attention than, say, servers or firewalls, yet they are a key feature of any business that needs to store and communicate data effectively between its staff. It is therefore essential to find the right company, like Vintage Technologies, to design, install and support your Computer Network as it is at the very heart of your business. Geographically, Vintage Technologies can provide network installation services for companies across Nigeria, not just in our local area of Lekki and Lagos. Local Area Networks (LANs) come in all shapes and sizes, from two PCs and a hub, through 802.11a/b/g Wireless Networks to vast switched networks running a variety of protocols. At the smaller end of the scale, it's relatively easy these days to install a computer network, as anyone who's successfully set up a home wireless network and router will testify. However, for businesses with more than a handful of users, a network needs to function at an acceptable level of performance which won't happen if due consideration has not been given at the early planning stage. Equally important is scalability, as companies need to know that a network will grow as their business does, thereby giving good return on investment. 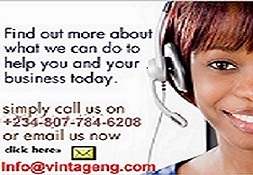 At Vintage Technologies, we work to build your network as a forethought, not an afterthought. We use a strong, project management design philosophy to come up with a network that is as simple as necessary, but can work within your requirements and expand easily. Where it is obvious that you will need to expand, we use equipment from trusted, well regarded vendors that have the right features to let you grow, avoiding in most instances, the costly re-specifying of equipment that many companies suffer. At each point of change, we can access the original design of your network and plan the next change accordingly. When it comes to scale, we have worked with cross-continent WAN links via international carriers, VPN links across countries and counties, wireless links across the road and of course, wired links between your office and your point of sale, within the shop. It is also true that computer networks do often need troubleshooting, especially those that have been 'thrown together' without careful forethought and planning. Networks such as these are often ripe for maintenance and when they get towards their full operational limits and have the capacity to fall very short of expectations if not correctly implemented. In short, what's suitable for home is rarely appropriate for the office. As the need for data grows within an organisation, whether via the Internet or via secured links to other business units, the complexity of the network grows with it. When managed carefully (one of our specialities), the change can be unremarkable and seamless. Whereas, growth in complexity can become cumbersome and painful if not carried out correctly and with the right products. One of our strengths is making change happen without the fuss you might normally expect. One of our most specialised areas is in the field of high-availability Wireless Network. We've worked for large organisations whose livelihood depends on achieving consistently good total wireless coverage throughout their premises.